Friday Funny – The Booker Prize for the biased BBC | Watts Up With That? Josh sketches up some humorous vignettes from the GWPF Report “The BBC and Climate Change: A Triple Betrayal” by Christopher Booker. Perhaps George Monbiot will award the “Booker Prize” to the BBC this year. December 9, 2011 in Humor, Satire. I think you need a flow chart. The report by Christopher Booker should be read by all Brits, especially those still paying for the TV license. Like we have a choice. If we don’t pay, we’re risking a £5000 fine or imprisonment. Do they still ding you if you drop the telly and get all your news and entertainment off the internet? I unplugged the tv back in ’08, and now I can pick which biased info source I unquestioningly accept..
December 9, 2011 at 9:54 am The report by Christopher Booker should be read by all Brits, especially those still paying for the TV license. You dont even need to own a TV to have to pay for the license. The law states that you need to be covered by a TV Licence if you watch or record television programmes, on any device, as they’re being shown on TV. This includes TVs, computers, mobile phones, games consoles, digital boxes and Blu-ray/DVD/VHS recorders. On the link above, I have nominated “The BBC” for the Christopher Booker Award for 2011. I wonder if I will get a response? I’m not holding my breath…………… . They collect this tax by having a list of all the houses, offices and places where people might be in the UK, then running the list of licenses against this list, and going round to all the places which are left. If you do not have a TV they will not take your word for it, but will try to get in and check. If they do check and agree that you do not have a TV NOW, they will put you down for checking again next year. It’s easier to pay the tax to avoid the intrusion…. And if you go to a shop to buy a laptop that can play DVD’s, you’ve got to supply you TV license number. We are, like the Christmas Turkey, well and truly stuffed! Sorry to be a little off topic here – BUT I have to say on behalf of Canada – for the fifth year in a row WE won the Eco-fanatics FOSSIL OF THE YEAR AWARD at Durban. I LOVE my award and hope to win this prestigious award for the next ten thousand years. We will accept nothing less. Canada as some here know refused to sign on to the son of Kyoto and refused to sign over millions of Canadian taxpayer dollars to the eco-freaks – allowing us to win this magnificent award once again! Bottom line – DON’T MESS WITH CANADA! albertalad – It is billions, not merely “millions” of taxpayer dollars saved. I laugh at those awards too. Just look who hands them out. Back on the topic of BBC and that compulsory payment for receiving (or not) that flow of propaganda, looks like time for a ‘UK Spring’ on that issue. Some organized resistance to that could work about now. I know the Brits invented concentration camps (Boer War) but I just can’t imagine them doing that over the BBC. s I recall they Gov’t even in the UK has to prove you own a TV. Smash the %$#% thing and have it sitting by the front door if they come by. This is from the USA but talks of UK law too. It seems as if the BBC has broken their end of the deal and perhaps a jury trial WITH DISCOVERY might kill off that particular vampire. Good Luck to our UK cousins. I’ve never had a telly. The licence people keep on pestering me but IIRC last time I could fill in a form to not be pestered so much next time. I believe it is possible to watch TV films that are being kept for a week, without infringing legality. Gail that quote made my day. Thanks. That bbc fee sounds like a “Stamp Act” to me. Large numbers of poor people fail to pay the licence fee, then get fined, then cannot pay the fine. At the end of the day, quite a few then get sent to jail for failing to pay the fine. The BBC licence fee is a highly regressive tax – the poor person with just one old TV pays the same as a rich person with a TV in every room. 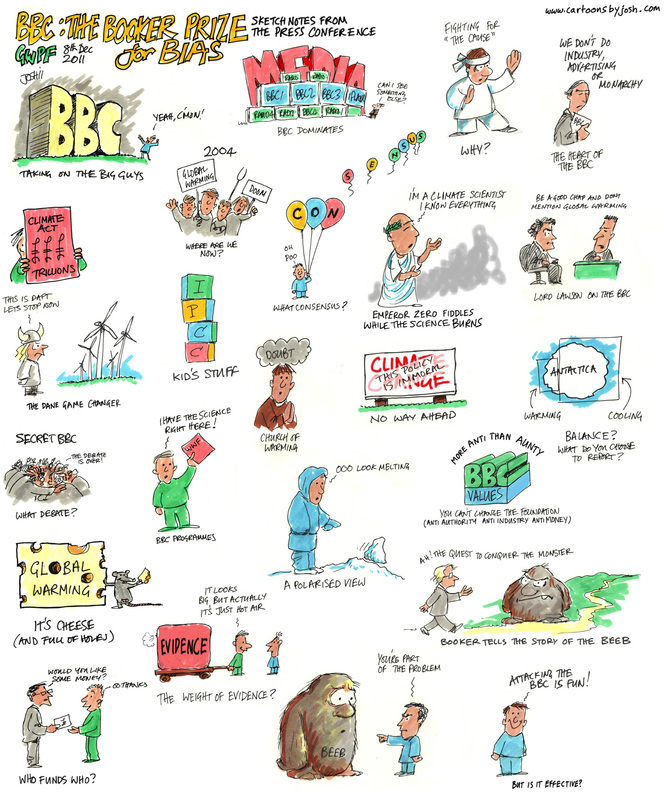 The Booker Report details many years of systemic BBC bias on Global Warming. The BBC blithely denies bias. Sir Antony Jay’s foreword (he wrote Yes Minister and had worked at the BBC) shows that BBC is biased across many issues, not just Global Warming. The idea of a state broadcaster supported by billions of pounds of compulsory licence fees is an anachronism – made worse by the endless bias in contravention of its statutory duty to be impartial on major issues. At least in the UK they can opt out if they do not watch. Here in the USA (and Canada and Australia) you pay for “Public Broadcasting” whether you want to or not because it comes out of the general tax funsds. I am sorry. I cannot laugh. Are we becoming so immune and so used to bias in public broadcasters that all we do now is accept it and produce cartoons about it? Why isn’t something done to fix it? Interesting that their 2011 edition includes a definition of IMPARTIALITY that I cannot find in earlier editions i.e. Does that also mean that on the ABC internet site The Drum we can accept 12 pro AGW articles to one questioning it? And an ABC filter police team that can refuse posts without explanation? 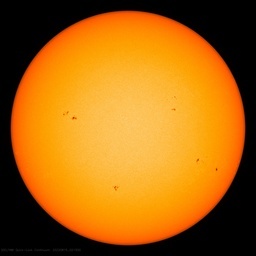 And an almost daily sermon on ABC radio or television with some alarming event that is happening or will happen unless we cut CO2 emissions? And no-one within the ABC questioning the senseless decision of a minority government to impose a carbon tax against an angry majority when before the election they said they would not do so? And when the world is increasingly questioning the practicality of an international carbon trading scheme. But the beaming light has been the Internet and websites like WUWT, The Resilient Earth, Jo Nova and Icecap and the millions of blogs that counteract BBC and ABC views. There is no doubt that this cyber revolution has made the public broadcasters even more biased than they ever were before. But even so, every night before you go to bed, thank God for the internet. Perhaps in a real democracy government funded organisations like the BBC and ABC must eventually disappear because they will always represent the culture of the chardonnay socialist set that Sir Antony Jay described so well in Booker’s Report. Maybe we do not have to fix it, they might just fade away like all the myths that they are perpetrating? And like everything else outside of essential services, if you want it, you will have to pay for it? For information. The BBC TV licence is currently GBP 145.50 (about $200). It is a flat fee levied on all but the very poorest and those over 75. There have been a number of attempts to challenge the licence fee over the years. All have been beaten down by a consensus. The bias in reporting goes beyond climate change. Under the Labour Government the BBC parrotted every day new Government initiatives (that never came to anything) justified by “reports” from government-funded, but semi-independent organizations. The opposition were rarely invited to comment. Now the Government has changed, there is more balance. that is the a Government spoke-person is cross-examined and then an opposition politician gets to chip in as well. In Britain statutes aren’t law – lawful only applies to Common Law, legal applies to statutes, it’s all in the language, legalese. Legalese is the language of corporations. If you have no contract with the corporation it has no rights over you. The Beeb cannot make the claims it does, that you need a licence to watch any live broadcast even those from other companies etc. and are subject to punishment for not having one, in Common Law. That is organised crime. The corporation needs your acquiescence to have that hold over you. It is unlawful in Common Law to demand money with menances..
Our TV licence is enshrined in British Law so we have to pay. The BBC has an enforcement department to ensure payment under threat of imprisonment. Real friendly people. We live in a police state here in the UK, cross the BBC and you’re toast. In addition to the power to judge both facts and law and thus nullify a laws application in a specific case, in the U.S., under the 5th Amendment , juries, in addition to their typical task of responding to the case at hand by investigating and deciding as to whether to return an indictment, have the authority to initiate their own investigations and make “presentments”. Courts and AGs naturally would not like such an authority to continue which is why they have smothered it over the years, the presentment power having been smothered by Note 4 to Rule 7 of the Federal Rules of Criminal Procedure in 1947. I own a fully functioning, (last time I had a TV licence,) TV. You have no obligation to allow the inspectors in to check! If you are foolish enough to allow them in, under no circumstances allow them to turn the device on, doing so means you have broken the law! The law states that if you view, or allow another to view or record live broadcasts on your premises, you must have a TV licence! The only advantage the BBC has over other channels here is that your viewing isn’t interrupted by advertising, it’s almost worth the fee just for that. If the BBC isn’t supported by this tax they’d have to go commercial, then I would give up the TV. Hmmmm…. If you are getting biased views [ propaganda ] – you are watching “advertising ” ….just not interrupted. Booker has a great article about David Attenborough in the Telegraph’s Comment section. Attenborough is much praised but has been found out (for the second time) to be deceiving the viewers when showing polar bear footage. In 1997, Sir David narrated over scenes of a mother snuggling up with newborns in Polar Bear, Arctic Warrior. It was criticised when it emerged it was filmed at a zoo in Frankfurt, Germany. Now it’s been revealed that a key scene from the hit BBC series “Frozen Planet” showing a polar bear tending her newborn cubs was filmed in a zoo using fake snow. Mixing real Arctic shots with zoo scenes, documentary makers fooled the audience into believing the footage was gathered by intrepid cameramen in the brutal sub-zero wilderness. It was actually filmed from the comfort of a wildlife park enclosure using bears in a man-made wood den.